A developing lockout trend amongst those with an online presence and interest in the NBA has been to scan/photo old basketball cards and share them on the world wide web. Some say we are doomed to repeat the past, in the future, if we don’t remember it (or something like that). I say the past is also great for present-day zingers, which is why I’m sure I’ll take part in basketball card scanning in the future (which, one really only needs the summertime to do, not necessarily a lockout — there’s also the fact that my sports cards are spread out between my apartment in D.C., a dad’s house, a mom’s house (both in other states), and a friend’s house in Virginia). 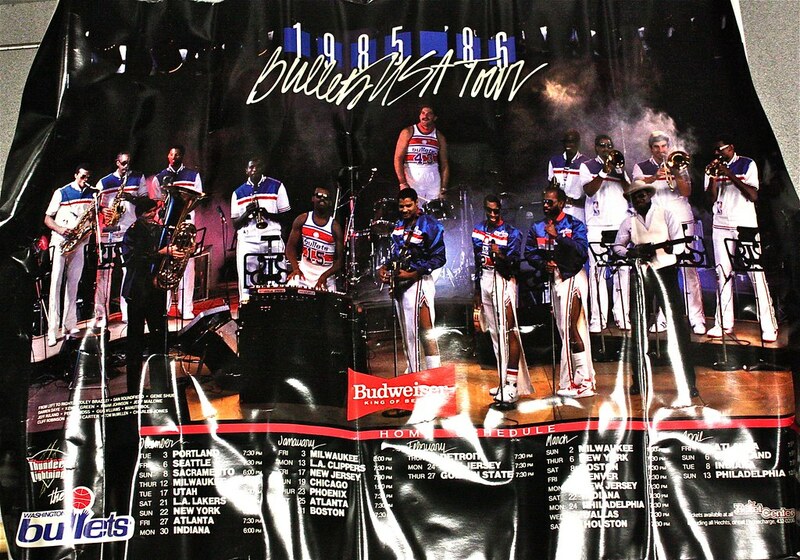 Anyhow, in lieu of those old basketball cards, today, I’m here to share with you some Washington Bullets posters from yesterday, equally worthy of nostalgic zingers, if not more so. 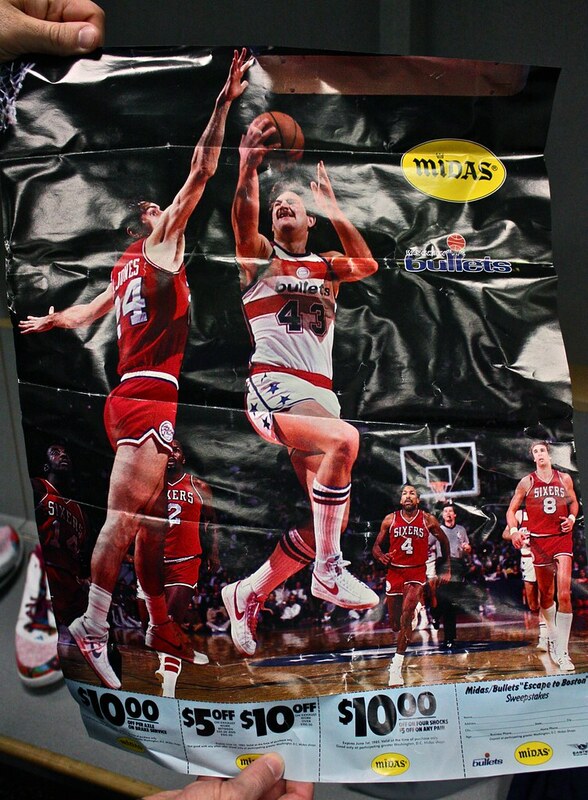 What you are about to gander upon (and please excuse the impromptu, perhaps hard-to-view photos of old-tymey wrinkled posters) comes courtesy of Wizards veteran Basketball Facilities Manager Jerry Walter. Jerry just completed his 20th season with the organization in his current area, but has been working home games in some capacity in upwards of 28 years. He is always polite, often wishing folks a good morning no matter what time of day it is, and when famished reporters await outside of the Wizards’ practice court for interview access, Jerry almost always offers, nay, insists that they hydrate with a cup of water. Nonetheless, many thanks to Jerry for the history. Because it’s not all always about preservation, but rather simply knowing the fact that the past exists (or existed — I’m still not sure how time works thanks to Through the Wormhole hosted by Morgan Freeman). Let’s proceed (note: you can click on the images to view in larger scale). Left to Right: Dudley Bradley, Dan Roundfield, Gene Shue (coach), Darren Daye, Kenny Greeen, Frank Johnson, Jeff Malone, Jeff Ruland, Perry Moss, Gus Williams, Manute Bol, Cliff Robinson, Fred Carter (asst. coach), Tom McMillen, and Charles Jones. Welcome to one year earlier, 1984-85. Can you spot a future U.S. Congressman? Why, that’s Tom McMillen standing to the far left, as if he really did have “White Man’s Disease” back then (Jeff Ruland seemingly did not). Can you spot the future dad of a current NBA player? That would be Darren Daye, father of Austin Daye of the Detroit Pistons (Darren is standing right behind the guy holding the ball, Gus Williams). 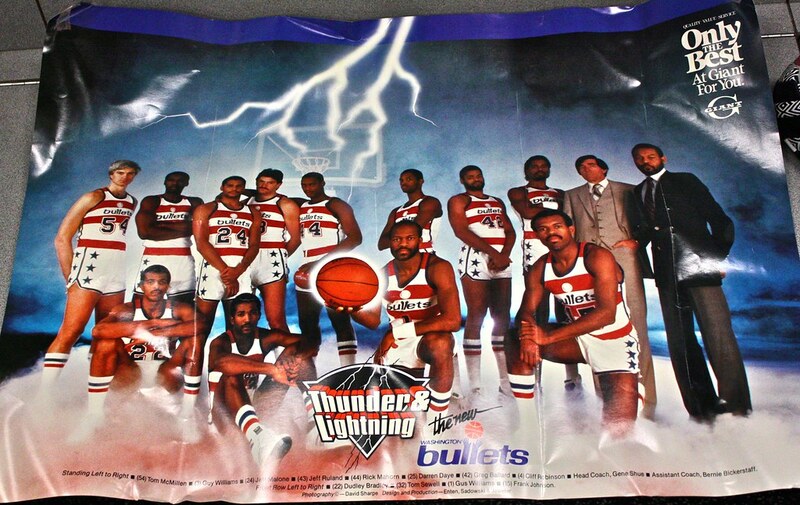 But the baddest man on the whole scene seems to be Bernie Bickerstaff, standing suited up to the far right — I’m thinking Laurence Fishburne in Deep Cover style. Standing Left to Right: Tom McMillen (54), Guy Williams (3), Jeff Malone (24), Jeff Ruland (43), Rick Mahorn (44), Darren Daye (25), Greg Ballard (42), Cliff Robinson (4), Gene Shue (coach), Bernie Bickerstaff (asst. coach) – Front Row L to R: Dudley Bradley (22), Tom Sewell (32), Gus Williams (1), Frank Johnson (15). 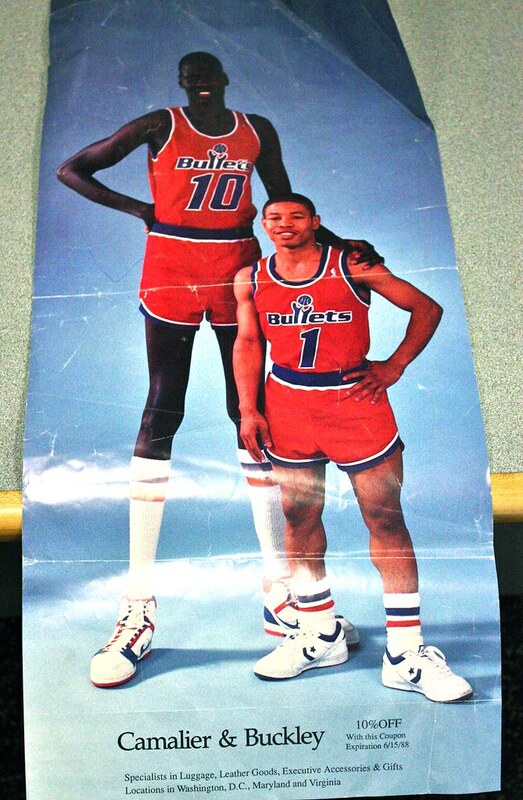 We are all aware of this iconic picture featuring the late Manute Bol and Mugsy Bogues, but did you know it was a promotion for Camalier & Buckley, “specialists in luggage, leather goods, executive accessories and gifts” (with a 10-percent off coupon that expired on June 15, 1988)? Well, it was. So that’s settled. On-the-record, Ruland scored this basket over Philly’s Bobby Jones and everyone went home happy. Off-the-record, Ruland vaporized Jones with a post-photo hip-check and resulting gaseous propulsion from the rear. Jones was never heard from again. Well, I hope you enjoyed all of this, even though, again, photos of old wrinkled posters are not the easiest to decipher with the eyes. If anything on this Friday afternoon, you and I are left lusting for pristine framed versions as a badge of honor for the franchise that we love and/or kind of like.